When Patriots fans protest the suspension of their star quarterback, it's civil disobedience. But when black youth protest systemic racism, it's up for question. Rallying under the banner “No Brady, No Peace,” New England Patriots fans turned to an act of civil disobedience at NFL headquarters in Manhattan last Friday. 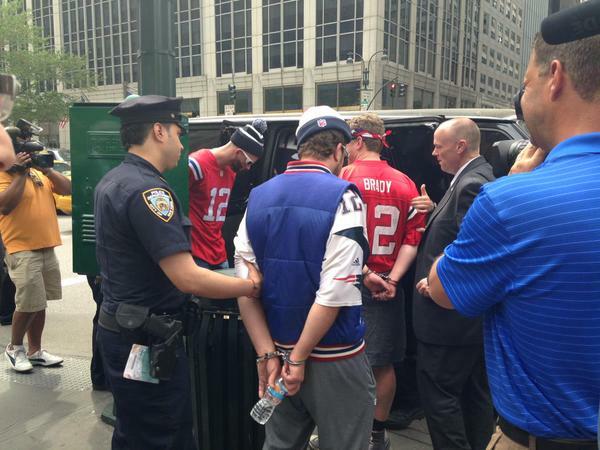 Decked out in full Patriots attire, four fans sat down and handcuffed themselves together to register their righteous indignation at the agency charged with holding NFL players accountable to the league-mandated rules. About 15 minutes later, they were arrested by the New York Police Department. Star quarterback Tom Brady was found guilty — or whatever the NFL calls its verdicts — in the infamous “Deflategate” case, in which Patriots employees intentionally deflated footballs to give its own quarterbacks a better grip on the pigskin. The franchise has been fined $1 million — which, astoundingly, is the largest in the league’s history — and will have to cede its first two draft picks. Brady has also been suspended from the first four games of the season for his complicity in the deflation incident. While Portnoy is hardly a spokesperson for fans of the country’s most popular sport — if anything, he is an acknowledged embarrassment in Boston — there is something troubling about the way his protests have been covered by the national media. Namely, how easy it was for them to be called protesters at all. For comparison, coverage of yesterday’s demonstrations in Madison around the non-indictment of Tony Robinson’s killer, Police Officer Matt Kenny, was preoccupied with demonstrators’ tactics, even as protesters remained “peaceful” in the most conservative definitions of the word. The Milwaukee Journal Sentinel quoted Madison mayor Paul Soglin as saying, “The city of Madison will continue to provide the greatest latitude in allowing for political expression, but illegal acts which jeopardize public safety such as impeding ambulances, will not tolerated.” Discussion of whether protests would remain peaceful — or expressions of amazement that they had — appeared everywhere from local Wisconsin publications such as Madison’s WKOW to national outlets like CNN and ABC News. There’s a simple formula that mainstream reporters seem to follow religiously: When working-class communities of color come together for any purpose, there can be no guarantee that they will remain peaceful. When any collection of predominantly white people gather — even if they burn couches in the street and destroy public property — it is assumed that they will remain calm, and that any violent outbreaks are temporary, forgivable and an excuse to let off the hard-earned steam of a semester in college, a day’s work or a tough season. The variable here, of course, is racism. Perhaps, as some small first step toward not being entirely complicit in it, newscasters could cover actual protests as charitably as they do frivolous ones.